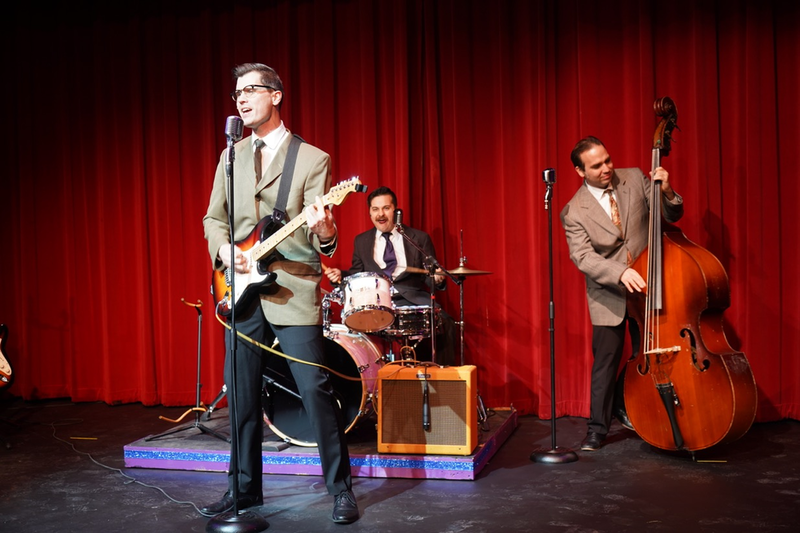 Garland Civic Theatre’s production of “The Buddy Holly Story” delivered a high-energy, immersive journey exploring the formative years of rock-and-roll as viewed through the bespectacled eyes of legendary Texas musician, Buddy Holly. With lively musical stylings and dynamic character portrayals, this supremely-talented cast took the audience on a surging, head-first adventure down Buddy’s path to break new ground in a music industry hell-bent on resisting change. Although hard to fathom, we’re now nearing the 60th anniversary of the musical pioneer and Lubbock, Texas’ native’s death, February 3rd, 1959. “The Buddy Holly Story,” told through the Garland Civic Theatre’s top-tier production, capitalized on supreme talent and raw energy to transport the audience to 1950’s-era recording studios, radio shows and stages beyond. Such a trip down memory lane struck exceptionally-deep chords with this theater full of North Texas residents holding fond memories of growing up listening to Buddy’s chart-topping hits. One of the Garland Civic Theatre production’s gems, and star of the show, Ian Mead Moore, unleashed a multi-dimensional, powerhouse performance as the iconic Buddy Holly. Not only is he a spitting image of Buddy, but his vocal stylings and guitar skills allowed him to quickly capture the audience’s affections and deliver a fully-dynamic, ovation-worthy, performance. ● Q: What unique aspects of Buddy Holly’s musical style and persona do you believe allowed him to skyrocket to such popularity and break new ground in the mid-1950s music scene? ● Q: How do you think growing up in Depression-era Lubbock, Texas influenced Buddy's musical style? Ian Mead Moore wasn’t the only dynamic talent to grace the stage in this production. Backed by Bill Zauner on upright bass as Joe B. Mauldin, and Jaren Lorenzo on the drums as Jerry Allison, Buddy’s band, The Crickets, showcased supreme talent and energy which drove this show skyward. Additionally, Erin McGrew’s portrayal of Vi Petty as well as her excellent rock-and-roll piano skills added even more deep layers of talent to this stage. Despite the rocking soundtrack, Garland Civic Theatre’s “The Buddy Holly Story” didn’t hesitate to tread more emotionally-complex ground. This cast highlighted deeper character dimensions to tell Buddy’s story including his self-assured swagger, quick temper, deteriorating relationships with The Crickets, and his marriage to Maria Elena, played by Sarah Garcia. Beyond the raw musical and vocal talents, the top-notch costuming and stage design gave the audience a taste of the sights of an authentic 1950’s rock-and-roll concert. Joined on stage by legends in their own right, Richie Valens, played by Jonathan Garcia and the Big Bopper, performed by Colin Philips, Garland Civic Theatre left no dimension of Buddy Holly’s stage performances unexplored. In fact, “The Buddy Holly Story” featured over twenty hits including Peggy Sue, Everyday, Oh Boy, Not Fade Away, Rave On, Raining in my Heart and, Ian Mead Moore’s personal favorite, Ready Teddy. Last, but certainly not least in this remarkable performance was the exploration of Buddy Holly and the Crickets’ debut at the Apollo Theater in Harlem. Although a traditionally African-American venue, the crowd, eager for exploration of music which spoke to them and their unique experiences, ultimately embraced this young white Texan musician’s style. The Apollo Performers in this production, including Tracy Pullin, Damond Cobin, Brandon Baker, Anthony Holmes, and, of course, the talented Ms. Sandy Young as Marlena, added yet another deep dimension to this story and helped the production soar. Although he departed the world stage too soon, the memory of Buddy Holly continues to live on for new generations in dynamic performances like Garland Civic Theatre’s “The Buddy Holly Story.” This must-see production is the perfect way for Texas’s to pay homage to Buddy and celebrate his music as we near the 60th anniversary of his death. Garland Civic Theatre’s production of “The Buddy Holly Story,” written by Alan Janes and directed by Dennis Canright, stars Ian Mead Moore as Buddy Holly and runs through February 10th, 2019 at the Granville Arts Center (300 North 5th St, Garland, Texas). Learn more about the Garland Civic Theatre and purchase tickets online at garlandcivic.org or call the box office at (972-205-2790).